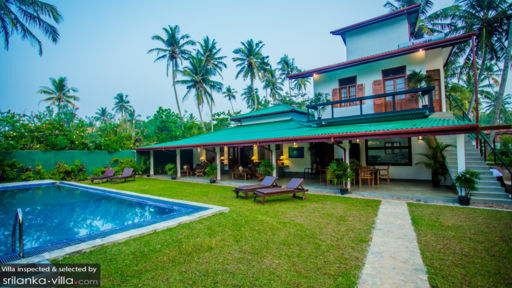 Found in a prime spot in Sri Lanka, close to beaches and surf spots in Kathaluwa and Ahangama, South Point Surf House is a resplendent, old-world Sri Lankan home that provides a retreat where you can relax, reset, and recharge. With expansive gardens, an open veranda, and surrounding tropical jungle makes for a pristine environment that is fresh and breezy. The five-bedroom, two-storey house is quintessentially a home away from home built like a colonial-era Sri Lankan bungalow. Sounds from a neighbouring train station and passing vehicles may be heard at the veranda and garden. With five bedrooms, South Point Surf House is the right place for a long-awaited family vacation. Four of the bedrooms are located on the main garden level while the fifth bedroom enjoys its own private space upstairs. It is adjoined to a balcony that serves as an excellent vantage point to view the garden and forests that stretch for miles ahead. All five bedrooms are air-conditioned and come with ensuite bathrooms. They have rain-showers, hot/cold water, and other amenities for your convenience. The four-poster beds are plush and comfortable so you can retreat to your bedrooms for sound sleep. The villa even provides three bunk beds additionally in case you’re travelling with more guests. The lush gardens at South Point Surf House are home to a lavish swimming pool that resides snugly amid luscious flora and tall palm trees that can be spotted over the roof of the house. The dense greenery is the perfect refreshment you need to let loose and leave behind the chaos of busy city lives. 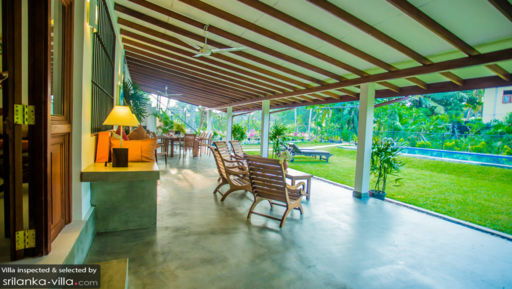 There are sun chairs for you to sunbathe and nap on, outdoor seating ideal for a morning/evening tea, and views of neighbouring jungles that will your mind at ease. 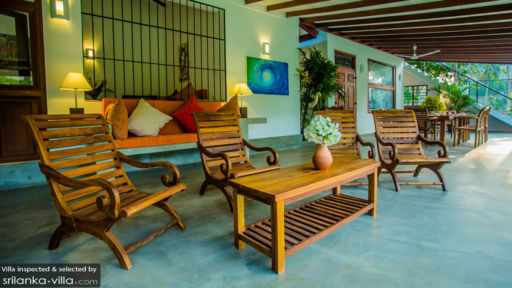 The main living areas at South Point Surf House begin where the garden ends with an expansive veranda which has been furnished with hand-crafted wooden furniture that sits facing a panorama of the villa garden. The veranda is where you will also find the dining area which may as well be alfresco-style since it is open to the outdoors. Thus, relish a piping hot, freshly-concocted feast amid the fresh air. Step inside through the antique doorway to reach the inner, living salon that provides a comfortable and cosy nook furnished with stone-platform, cushioned sofas. The walls are decorated with rich artwork while the ceiling slants and has wooden trusses giving you a gorgeous, colonial feel. A spacious kitchen with stainless steel fittings, modern appliances, and amenities for your use is available right at the villa. Everyone can hang out together to prepare decadent meal as there is a lot of room to move around. The large windows allow an unobstructed view of the manicured gardens and can be left open to the tropical breeze. For your ease, the villa is staffed to serve your requests and needs. Housekeeping service is available to guests as well and upon request a chef can be called in to delight you with local delicacies. The villa is located in a spot that is close to some of the major beaches, surf spots, and sights in Sri Lanka. Two-minutes walking would lead you to the closest beach whereas, head to Ahangama to hit the surf breaks. Yala National Park is another memorable adventure waiting to happen only a short drive from the villa. Head to the historical city of Galle to take a tour of the UNESCO Heritage Galle Fort. Another life-changing experience in Sri Lanka has to be the turtle hatcheries where you might be lucky enough to see the newly hatched turtles being released back into the ocean.